Disclaimer: The following is nowhere near a comprehensive inventory, but it’s a place to start. Concluding a talk on Jewish pride, I offered to take questions. A hand shot up in the front. In any high school in America I suspect, if the topic were “Black Pride” or “Gay Pride” or “Feminist Pride” or even “Muslim Pride,” the speaker would be welcomed by the students with enthusiasm and high praise. The audience would have left the presentation fired up for social justice and the desire to support the underrepresented by protesting and convincing their parents to give to worthy charities and political action groups. Just about the only subject that would receive a worst reception would be a talk on “White Pride,” which probably would be racist. So is “Jewish Pride” racist? Probably not, and I don’t think it’s really possible that “Jewish Pride” to be racist. You have people from Sweden and Ethiopia who are equally Jewish, so how can it be racist to be a Jew? 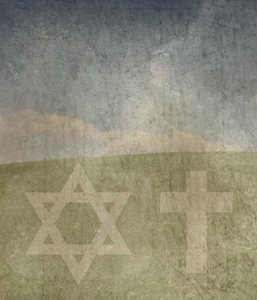 Judaism is something that transcends race as it does religion. It’s a deeply uniquely-lived experience and identity (and I only know this second-hand from being married to a Jew). What does this mean for Messianic Judaism and that generation being raised by members of the movement (or whatever you want to call MJ)? I know that both Judaism and Christianity have programs in their houses of worship and communities aimed at fostering the faith in their children. However, sources such as Cold Case Christianity, Christianity Today, and ChurchLeaders.com confirm the trend that a large population of teens and young adults are leaving the church for a variety of reasons, “relevancy” being key among them, even though there are numerous programs designed to speak to their youth population. A similar tale is told of young Jews and Judaism by NYC Religions and the Pew Research Center, although an added factor is that some Jews who have left religious Judaism converted to Christianity (which the church would see as good, while Judaism and even Messianic Judaism would definitely have concerns). Messianic Judaism, however you conceive of it, has, in my opinion (though I could be wrong since I haven’t been part of a religious community in years) an even bigger problem. Based on my experiences, kids in that movement also tend to leave, either for secularism, more traditional Christianity or more traditional Judaism. Add to that the size and relative rarity of MJ communities in any part of the US and Canada. A family may adhere to an MJ view of the Bible, but the nearest congregation could be hundreds of miles away, so when kids grow up and leave home, they very well will leave their faith behind, too. The only group I know of attempting to slow or halt the trend is First Fruits of Zion (FFOZ) which produces products such as Children’s Torah Club and other resources. Also, apparently, their 2016 Shavuot conference was on the topic of youth outreach. Of course, I have no way to gauge the effectiveness of those methods or even to know the population size of MJ in general or by age group, but at least somebody is doing something. However, based on the other information I’ve cited, it seems like secularization has firmly taken hold of youth, both inside the body of faith and beyond. In modern, western society it seems, Christianity and Judaism are blamed for a variety of ills, and it’s not just the faithful who are under assault. Although many deny it, an attack on national Israel is an attack on the Jewish people because it denies the Jews the right to their own sovereign nation. We even have a few freshman U.S. Representatives who have been making headlines lately because of that, questioning the existence of our nation’s closest ally in the Middle East. I’ve also noted a lot of push back against the landmark and popular (in spite of its topic) film Unplanned starring Ashley Bratcher, including the movie’s twitter account mysteriously losing thousands of followers (though this seems to have stopped after many complains were registered). Additionally, actress Alyssa Milano has been leading Hollywood’s charge against Georgia’s recent “heartbeat” pro-life law, though Bratcher has responded to Milano’s boycott. Wait! What’s abortion got to do with young people leaving the church and the synagogue? It’s one of the values of secularization, and perhaps one of the most important ones, a sort of “Holy Grail” of the secular. Any potential threat against free access to abortions, in some cases up until birth, is thought of as a heinous affront and must be combated with every resources available especially by the Hollywood public opinion machine. So many of our young people take this “right” for granted. If Christianity and Judaism threatens this and many other “rights” by touting how human life is sacred, then young people in houses of faith are more likely to struggle with choosing between the “relevancy” of their faith vs. the “relevancy” of secular cultural norms, and thus is the problem. Racism, climate change denial, anti-choice, the list of pejoratives goes on and vulnerable young people, many of them it seems, don’t want to be associated with those highly emotionally charged labels. So what secular post-modern civilization considers “relevant” makes many of the values of Christianity and Judaism “irrelevant.” The exodus of young people from the faith continues. What to do? Besides what’s been suggested at the various links I’ve posted, I don’t know. I have three adult children who were young at the time when my family was transitioning through Christianity, Hebrew Roots, and Messianic Judaism (and in my wife’s case, out the other side to more traditional Judaism), and I think they became so confused that eventually, they departed from all of it. Ethnically, they all identify as Jews, but that’s about it. I’m pretty sure one, maybe two keep a sort of Leviticus 11 “kosher,” but I was at the third’s house yesterday, and he was cooking up bacon for his kids for dinner. I’ve heard of this “culture war” for decades and didn’t think too much about it, but now it seems that I was wrong. This “war” is real and it’s taking our children and grandchildren from us. While Congress has yet to decide the future of the country’s illegal immigrants, some say they are critical to the survival of Christianity in America. Rodriguez says Americans can fulfill the great commission by ministering to their immigrant neighbors next door. Maybe the key to understanding how to preserve and grow future generations in Messianic Judaism is to understand what dynamics drive the two groups I’ve listed above. I would add that great care should be attended to concerning the idea of evangelizing your neighbor. It has been a habit for decades (that I know of) to treat a neighbor like someone who is going to hell because of theological differences — whereas a mature believer will be onto that and not have patience for the arrogance approaching. I find that many people who get an evangelical bug aren’t the kind of people I want to be around… like my mother, who has watched me live my faith my entire life — as well participate in the Messian culture. She has had to leave (because of her, shall we say, shortcomings) more than one “house of worship” as you put it. But she’s going to a Catholic church now. So… She’s imagined she’s going to “fulfill the great commission” by making me christian. Anyway, I like the open-mindedness toward having immigrant neighbors — on your part. (I haven’t seen any immigrants at her church).